EARLY BOOKING OFFERS ON YACHT CHARTERS: SUMMER 2016. 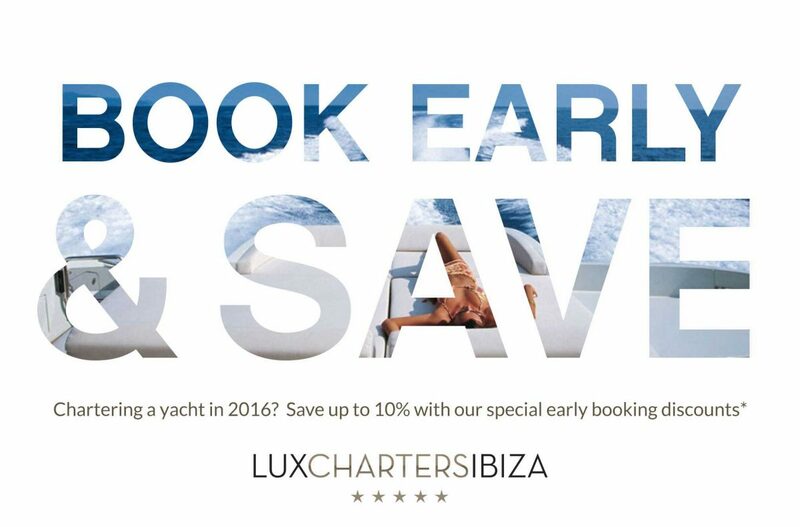 If you are thinking about chartering a yacht in Ibiza in 2016 take advantage of the LuxChartersIbiza early booking offers. Book before 30 Dec 2015, and save up to 10% on any day charter, short-week or week-long booking. Imagine sailing for a week around the Ibiza and Formentera on a 15m Jeanneau 509 sailboat or an amazing Lagoon 450 catamaran and save up to €800. Save up to €330 per day in early booking discounts for day charter aboard these superb 60ft + motorboats: the Sunseeker Predator 60 and the Dangermouse 68 with Seabob underwater scooter. Or if you are looking for a gorgeous Superyacht, check out the Leopard 27 Open, and if you book now for 5 or more days in high season, you can save up to €1000 per day. The amazing Mangusta 80, is now taking bookings for day or week charters, and if you book now, you can save up to €840 per day. These are just a few of the offers available. We can also negotiate early booking discounts for you on many other yachts and motorboats in our portfolio. View our current special offers at LuxChartersIbiza.com/offers or get in touch and let us know what you are looking for and we’ll help find the perfect boat with the perfect offer, for you.